There has been a lot of talk these days about ‘springing forward’. Last week, I became convinced that I had lost one of my Brittany double pointed needles. I had been lugging my sock around with my spectacular pile of music and discovered on Friday morning that I was missing one. It cut me up, it really did. Not only would I have to wait at the opticians with nothing to do, but I would have to live with the knowledge that my needle was sitting under a cushion in St John’s cathedral… or between the floorboards in the Presbyterian Hall… or in a bin with the plastic bag I threw away… or on the bathroom floor in the Tower Hotel. 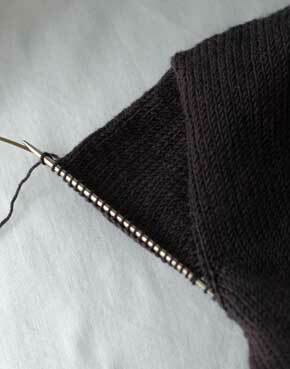 I eventually accepted the inevitable and continued my sock on three instead of four needles. Anyway, last night I was looking for a scissors and picked up the backpack I’d had with me in Sligo. Whatever I did, I managed to sort of pick it up and fall forward over it at the same time. An awkward manoeuvre, yes, but I found my needle! My omniscience was such that I had tucked my extra needle away in a tiny little pocket in case I would lose it. Sigh. It only took a week to find. So yeah. Contrary to popular belief, the Feis was not only manageable but a bit of fun, too. I didn’t get much knitting done the days that I was working but I made up for it over the weekend. I finally finished the grey sleeves of death. A little summer t-shirt out of Sampa natural cotton (so soft!) 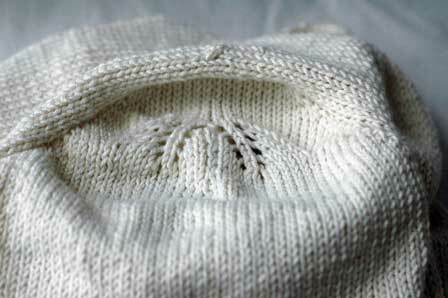 for This is Knit. 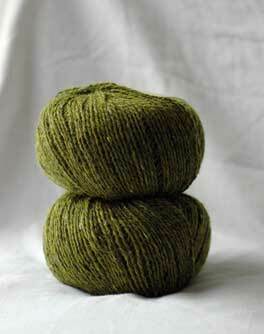 And I started a wrap-around cardigan for myself out of Rowan Kidsilk Aura. It was the colour. I was powerless in its presence. Surely you can understand. So things are back to normal here, such as it is! 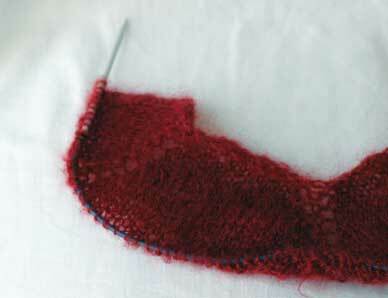 I am teaching a colourwork class at TIK this Saturday morning. 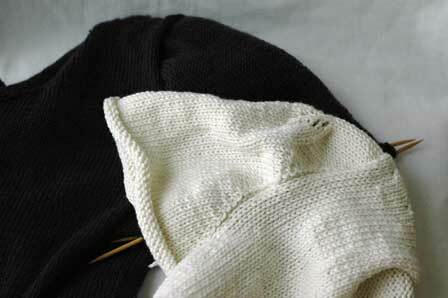 The class will cover stranding techniques and be put into action with a straightforward hat pattern. To be the best of my knowledge, there is only one place left! I will also be teaching a class on Professional Finishing on April 26th and a beginner’s guide to crochet on April 27th. Yes! Crochet! Nothing to be afraid of. And for those of you who are spluttering into their tea and saying, a knitter teaching a crochet class? I crocheted for at least ten years before I picked up my needles in earnest so I’m not really chancing my arm (this time). If none of these classes appeal to you, there are going to be loads and loads more classes run between now and September. Beginner courses are going to be run every month and the design class I taught in February will be back with a vengeance at the end of May. We also have some really exciting things up our sleeves but you’re just going to have to wait to find out what they are! Sleeves! Sleeves! Who will buy my wonderful sleeves? I have been wondering if my sleeve woes are connected somehow to the vernal equinox. Each sleeve I knit got progressively worse the closer we came to the equinox. Once it passed, each sleeve became progressively better again. I’m going to put it on my list for PhD thesis ideas. 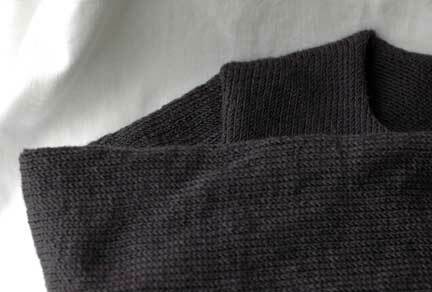 Misshapen sleeves, their connection to earthly movements and its effect on knitters can join Men and the invisible hunchback: why we are compelled to knit for them and the pitfalls that lie therein and Steeking: living with an obsession. I finished the Prima top yesterday. It is totally finished. I wove in all the ends and did a simple crochet border all around. I really like how the sleeve cap came out (Eventually. Talk about pulling teeth.). And the neckline lies very nicely too. It is a little more scooped than I had intended but who knows what it will look like on the model (the only information I was given was to knit for a 36″ bust). This will be showing up in the Summer issue of Yarn Forward. I am way ahead of schedule with this one but I am glad because I want to move on to some other things – the grey cardigan, for example. I will be AWOL for the next few days because I am working as vocal accompanist for Sligo Feis Ceoil. I haven’t had cause to write about how I actually earn a living in a while so for any new readers out there, I am a pianist by trade. I teach piano, work as a music examiner from time to time and as an accompanist too, when I get the work. I have never worked as an accompanist for a Feis before so I have no idea what to expect. All I know is that I have two long days, 9am to 9pm, and that there will be a lot of coffee involved. Look who’s back! They had a great time in Florida. Sleeve #1 stayed in the shade and lost a little weight. This little number is almost finished. I need to weave in the ends, put a little picot edging on it and block it out. I think I knit the sleeve cap about 6 times in the end, but I am really happy with the shape of it (I know it looks like a flattened flower above but trust me, it fits great!) and with the placing of the lace panel. Sleeve #2 had major reconstructive surgery. I had got as far as 2″ down the last sleeve from the underarm and was saying to myself, maybe it will block out. I got out the iron and while I was waiting for it to heat up, I looked at the sleeve and thought, that is never going to block out. I ripped it out and picked up my stitches again – this time with 30 less than before. It seems to have made all the difference. I have even made a note of how many stitches I’ll need to pick up again for the other sleeve to avoid this situation again. I should have this cardigan finished already! I want to get to the steeking! I had the opportunity to make it along to Knit Night at This is Knit last Thursday. It was great. I had had the worst day imaginable. Something to do with a job I have to do next week, being swamped in music for it and having a nervous breakdown over the whole situation. It was good to get out and be silly with some other knitters for a while. I got to see Jacqui’s Fluffy Cuffs (love the colour combination!) in person! And I picked up some Helen’s Lace. I want something to wrap around myself. I have only ever knit myself one shawl and it came out scarf-sized. I wear it all the time, but I’d like something larger for when I don’t want to bring a cardigan. 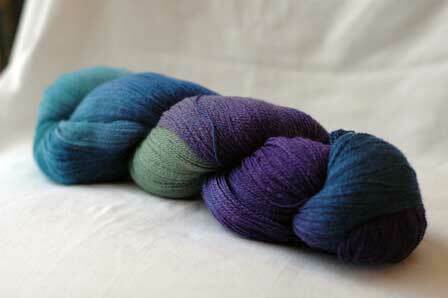 I think a Swallowtail Shawl would do the trick. Anything that’s not a sleeve. If I were a mob boss, these sleeves would be sleeping with the fishes as I speak. These sleeves are dead to me. Last seen yesterday. Current whereabouts unknown. What do we need arms for anyway? That moment – when some clever monkey decided to come down from the trees, when God had some left-over human-dough, when Zeus had that twinkle in his eye, whatever you want to believe – that moment? A pox on it! A pox!! Now we have arms that I have to knit for. There’s nothing wrong with some fins and a versatile set of teeth, you know. Everybody gets stuck from time to time. These days, it feels like I am running on the spot. I have been trying to solve some problems (like the sleeve of my Prima top and the hem of my grey cardigan) and trying not to be distracted by newer, shinier projects. The result is that I am making no progress on either front. 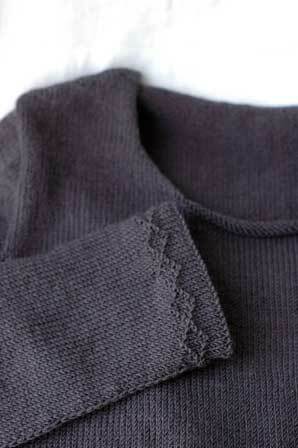 The sleeve of the Prima top. 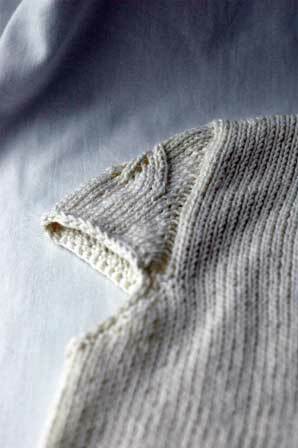 The first time I knitted it, I filled out the entire sleeve cap with repeats of the pattern you see there. Verdict: monstrous. The second time I knitted it, I left just the first repeat, as shown, but by the time I made it to casting off, I realised that I shouldn’t have picked up stitches right around the armhole. 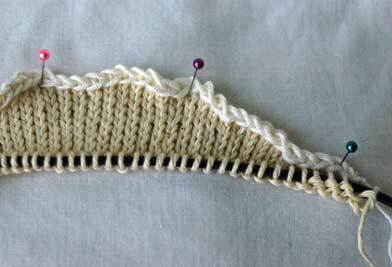 I left out the gusset stitches and thought that would be adequate to give it a little cap sleeve look, but it wasn’t. Third time lucky? We’ll have to wait and see. 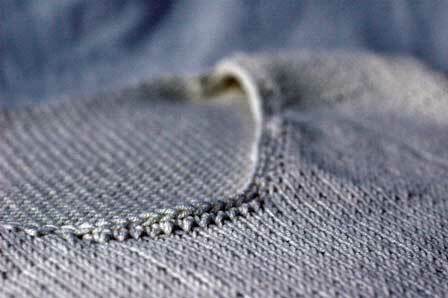 The hem of the grey cardigan. This really wasn’t a problem, I was just putting off doing the little bit of sums required. You are looking at the hem upside down there. 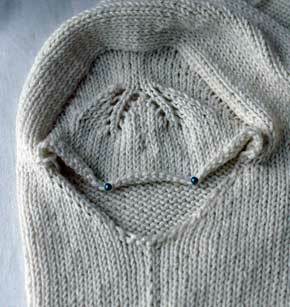 The diamond shape will run along the bottom of the cardie (and if I remember, along the sleeve cuffs, too). If you look really closely, you’ll see the turning purl ridge above the diamonds. I rather like the diamonds, it relieves the endless stockinette pretty well. Ever since steeking my mum’s cardigan I have periodically thought to myself, there has to be a better, tidier way to steek than the way I did it. 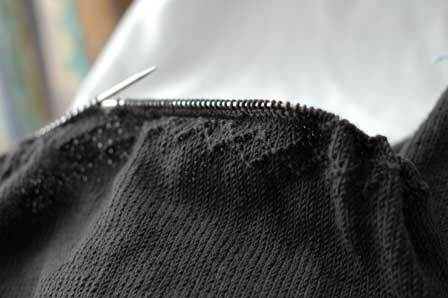 I had a poke around and came up trumps with this: Eunny Jang’s guide to steeking. Read it. You’ll never need to read up about steeks ever again. The newer, shinier project. Rowan Felted Tweed for a Tangled Yoke cardigan. (You can understand why). I ordered this about ten days ago through This is Knit, fully expecting it to take about three months to arrive. It came during the week. I have swatched. I have read the pattern in its entirety. I have even done some calculations to see if I could work it in the round from the top down (I could but I’m not going to live that long). St Patrick, please send me a snake to work out those stupid sleeves before I start casting on ‘just to see how it works up’.